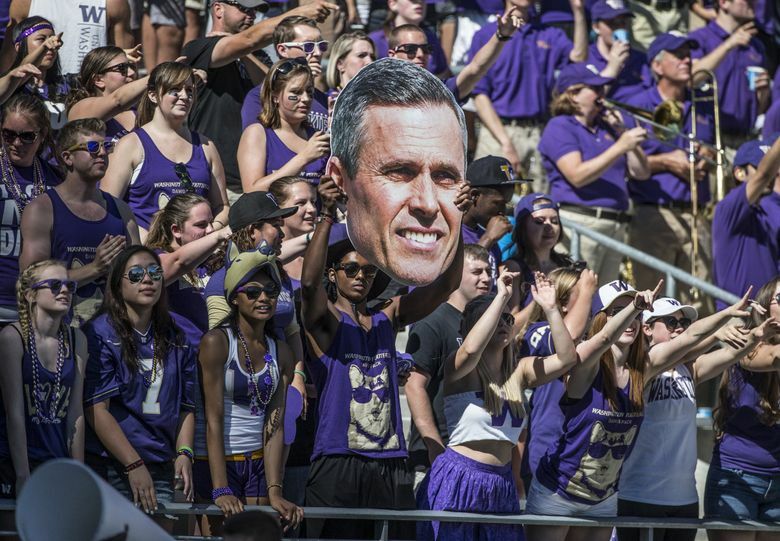 UW coach Chris Petersen apologizes to fans for the after-dark kickoffs, calling them "painful" for all involved. Late kickoffs are the new normal in the Pac-12 Conference. They’re not even new, really. This is the sixth football season Pac-12 teams have played under the conference’s 12-year, $3-billion television rights deal with ESPN and FOX, which have regular slots each Saturday night that need to be filled by Pac-12 football programming. And yet six seasons into this after-dark relationship, the challenges for just about everyone involved seem as painful as ever. At least, that’s the word — painful — that Washington coach Chris Petersen used Monday to describe his feelings heading into back-to-back 7:45 p.m. start times for his team over the next two Saturdays. “I just want to say something to our fans: We apologize for these late games,” Petersen said. “And I’d also like to reiterate it has nothing to do with us or the administration. We want to play at 1 o’clock. It hurts us tremendously in terms of national exposure. No one wants to watch our game on the East Coast that late, and we all know it. The No. 6 Huskies (5-0, 2-0 Pac-12) host California for a 7:45 p.m. kickoff Saturday on ESPN. They’ll then head to Tempe for a 7:45 p.m. against Arizona State on Oct. 14. Washington is hardly the only school in the conference playing regularly after dark — Stanford has a 7:15 p.m. kick this weekend, and then an 8 o’clock start next week — and the Pac-12, certainly, has heard of the continued cries from frustrated fans. It’s just, well, this is what the conference and all 12 member schools signed up for when they sold their TV rights. As a business model, ESPN and FOX have to try to maximize their revenue by placing the Pac-12’s best matchups in their primetime windows, thus creating a larger viewing audience. Even if that means starting some games while most of the East Coast is sleeping. Scott, in his interview with Yahoo Sports, said he does not believe the late kickoffs are detrimental to the Pac-12, pointing to appearances by Washington and Oregon in the College Football Playoff over the past three seasons. In 2016, the Pac-12 announced two new broadcasting windows for games on the Pac-12 Networks, starting at 2:30 p.m. or 6 p.m. But those only reduce the total number of late kickoff by four over a full season (meaning, in theory, each Pac-12 team can expect one earlier game only once every three years). And those Pac-12 Networks windows are largely a moot point for highly ranked teams, like Washington, whose games will almost always air during primetime on an ESPN or FOX channel. Late starts can have an effect on ticket sales too. Washington, for example, has had just two sellouts at Husky Stadium in its last 29 games going back to the 2013 season. There are other factors involved in ticket sales — a team’s success being a prime one — but many fans point to late kickoffs as their biggest reason for staying home. Petersen was asked Monday if he felt it was important for him to raise his voice on the issue of late kickoffs.